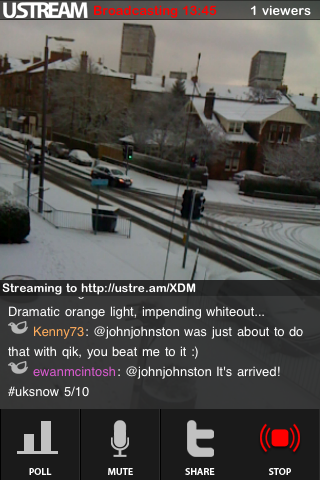 I’ve had this installed for a few days now, but the flurry of snow tweets (the #uksnow Map 2.0 is looking great) reminded me to try the live streaming from my iPhone to USTREAM. I must say I was surprised at how well it went. This was using a wireless connection and a G3 not G3s iPhone. I think the quality is not too bad especially after I turned the phone the right way up. A stand would have helped rather than a pile of videos(sic), dvds and books. The twitter integration is good too.